Harper got her start as an independent businesswoman in Rochester, New York, where at the same time Susan B. Anthony and Elizabeth Cady Stanton were beginning their campaign for women's rights. A former servant developed an influential beauty regimen -- and innovated business practices when she created the first franchise system of independently owned salons in the U.S. and Europe. Martha Matilda Harper was both an entrepreneur and a beauty expert. 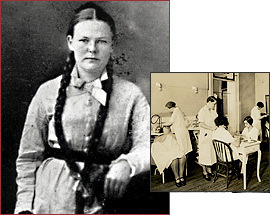 She was born into a working-class family in Ontario, Canada, on September 10, 1857. When she was seven, her father bound her out into service as a domestic servant in Rochester, New York. Like another beauty entrepreneur, Sarah Breedlove Walker, Harper would toil at menial work for years before striking out on her own. Harper felt that the chemicals in hair shampoo and other products were more harmful than good. She developed her own hair tonic in her spare time and eventually saved enough to open her Harper Method Shop in 1888. She used her own floor-length hair as an advertisement for her beauty method, which encompassed hygiene, nutrition, and exercise. Harper invented the first reclining shampoo chair, and initiated the concept of the professional "salon." Previously hairdressers had visited customers privately, in their homes. Perhaps Harper's greatest achievement was developing a franchise system in 1891. She created a network of salons that bore duplicated services and products. Each salon was run by a woman trained in the regimented "Harper Method" of beauty -- but the franchisees owned their own salons. Harper inspected the franchises, provided training and group insurance, and supported them with worldwide advertising campaigns. At the height of their success, the Harper salons numbered more than 500, along with a chain of training schools. The Harper Method's popularity was confirmed by an illustrious clientele that represented America's political and cultural elite: Woodrow Wilson, Susan B. Anthony, Calvin and Grace Coolidge, Jacqueline Kennedy, Helen Hayes, and others. Harper married a man 24 years her junior in 1920, and they ran the business together for 15 years, until Harper retired at age 78 and passed control to him. By the time Harper died in 1950, her salons had dwindled somewhat in number, but her reputation as a beauty expert and as a businesswoman remained strong. Today franchise businesses are ubiquitous in the American retail landscape.